This side-by-side image shows a Cassini radar image (on the left) of what is the largest body of liquid ever found on Titan's north pole, compared to Lake Superior (on the right). This close-up is part of a larger image and offers strong evidence for seas on Titan. These seas are most likely liquid methane and ethane. A NASA spacecraft has found evidence of huge seas, likely filled with liquid methane or ethane, in the high northern latitudes of Saturn's moon Titan. The very dark features, detected by a radar instrument on NASA's Cassini spacecraft, are located near Titan's north pole, and one of them measures at least 39,000 square miles (100,000 square kilometers), much larger than similar features seen before on the Saturnian moon. Titan is the second largest moon in the solar system and is about 50 percent larger than Earth's moon. Methane is the principal component of natural gas. Ethane, also a colorless and odorless gas at room temperature, is the second largest component of natural gas. "We've long hypothesized about oceans on Titan and now with multiple instruments we have a first indication of seas that dwarf the lakes seen previously," said Jonathan Lunine, a University of Arizona scientist who works on Cassini data. One goal of the mission was to find seas or lakes on Titan. So far, it's been lakes and now the small seas. Before the spacecraft arrived at Saturn in July 2004, one scientist predicted that Cassini would find full-on oceans with waves on Titan, but that finding has yet to turn up. There is no proof yet that these seas contain liquid, but their shape and darkness indicate smoothness, and other properties point to the presence of liquid, Lunine said. The liquid is probably methane or ethane because those compounds are abundant in clouds in Titan's atmosphere. Imaging cameras on Cassini also captured an overall shot of the region around the huge sea [image], so scientists currently are trying to use them to further test the idea that the seas are filled with liquid. Radar data of the largest sea basin shows details similar to those seen in earlier radar observations of much smaller, liquid-filled lakes, Lunine said. 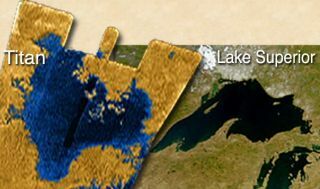 Titan's high northern latitudes are dotted with seas hundreds of miles across, and hundreds of smaller lakes that vary from several to tens of miles across. Scientists have long thought that Titan's surface supplies methane to the moon's atmosphere, so the presence of lakes and seas makes sense in light of that. The seas discovery has prompted Cassini mission engineers to repoint Cassini's radar instrument to pass directly over the dark areas during a May flyby of the moon.